“Invicta Cars” was founded and run by the wealthy businessman, Noel Macklin. He was born in 1886, educated at Eton and then served as a Captain in the Royal Horse Artillery in the Great War. He was wounded and invalided out in 1915. He set up the Invicta company at his country estate in Cobham, Surrey in 1925 with financial backing from his friend Oliver Lyle of Tate and Lyle sugar refining dynasty. He produced a range of cars that were modestly successful and ultimately launched the 4½ Litre S Type at the London Motor Show in 1930. His goal was to make a car with the quality and reliability of a Rolls-Royce and performance that would better a Bentley. Accordingly the car was made of the finest materials, an immensely strong nickel steel chassis lugged together with huge bronze castings and fitted with a cast aluminium bulkhead. The car cut a low profile and at the back the chassis legs passed below the rear axle. The car was powered by the reliable 4½ Litre Meadows engine. In Macklin’s own words “the essential characteristic of the Invicta was luxurious speed” and he was so confident of his product that he offered a Rolls-Royce style three year guarantee. The Invicta reputation as a sporting marque was greatly enhanced by the exploits of Miss Violette Cordery, Macklin’s sister in law and a celebrated woman racing driver and adventurer in her own right. She successfully undertook and number of record breaking feats including a number of world record breaking endurance drives on race tracks; 1926 at Montlhery 5,000 miles at an average speed of 70.70 mph and 1928 at Brooklands 30,000 miles at 61.57mph which took 21 days to complete. Then in 1928 a round the world drive that saw her and her companions, a nurse, a mechanic and an RAC observer cover 10,266 miles in five months. The S Type Invicta gained the soubriquet “100 mph”, a big deal in those days, and the model was as famous for its performance as it was for its build quality. The S Type was launched in June 1931, a date best remembered in motoring history for the bankruptcy of Bentley Motors. In the wake of the Great Depression other marques were to suffer the same fate, including Lagonda in 1935. Very expensive luxury sports cars were hard to sell but Invictas remained in production until 1934 when the company was wound up. Macklin’s refusal to cut costs, build quality and workmanship contributed to the company’s demise. Only 77 Invicta S Type chassis were produced and 56 are thought to survive. The standard coachwork offered was a Sports Tourer with coachwork by Carbodies. Strong and lightweight this very low, angular and rakishly attractive style has naturally become the most desirable for collectors today. The generous mudguards with their deep valances give the car an impregnable look whilst the long bonnet with the chrome exhaust protruding leave no doubt that this is a car with sporting potential. S44 was completed in 1931 and delivered to the dealers T.M. Dixon Ltd in Redditch, Worcestershire. They were motor agents and had sold the car to a wealthy 24 year old racing enthusiast called Lindsay Eccles. Eccles and his older brother Roy were heirs to a huge steel producing business in South Wales, the Britton Ferry Steel Company and accordingly allowed them to enter the elite world of motorsport. Lindsay Eccles had his first taste of competition in 1931 when he entered the Invicta into the Shelsley Walsh Hillclimb. He drove well and remembers several moments in the “Esses” which he attributed to a whippy chassis but finished second in class. This result is the more impressive when you consider that the winner was the 32 year old and seasoned driver Raymond Mays, also in an Invicta. This was the famous white car that was sponsored by the India Tyre Company and fitted with a special race engine supplied by Meadows. This success clearly whetted Eccles’ appetite as he returned with the Invicta to Shelsley twice in in 1932. He went on to race a significant number of cars and was a regular at Brooklands, principally competing in privately in Bugattis. The history file has a number of photos of his appearances at Shelsley with the Invicta. 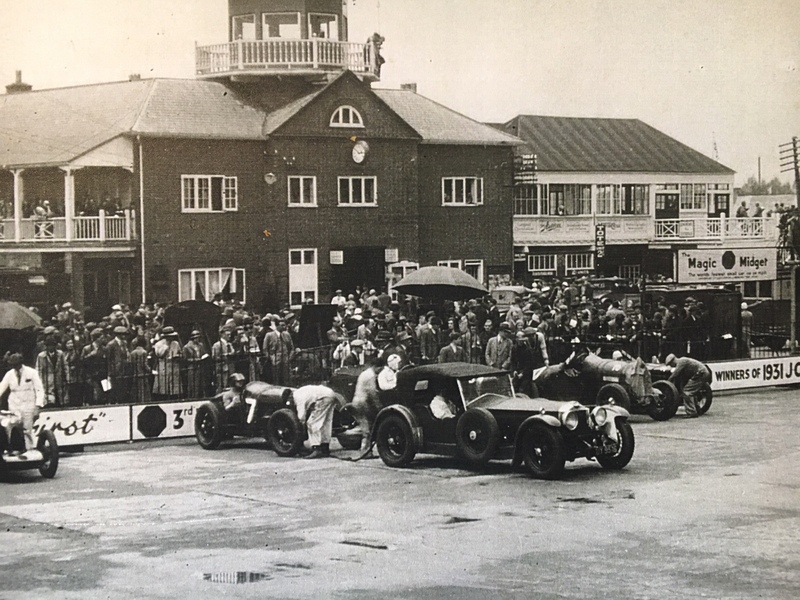 There are other pictures of the car as well including a remarkable shot of it tow starting one of his Bugattis outside the Brooklands Clubhouse. Eccles kept the car until 1934 when he sold it to fund the purchase of 3.3 Litre Type 57 Bugatti. The current owner wrote to Eccles in 1988. He had found him retired in Penmaen, near Swansea and his letter back is a tangible link with the cars first owner. The next recorded appearance of the car is in the Invicta Club magazine “The Gauntlett” in August 1938 when A.M. Malone of Andover, Hampshire is announced to have returned from abroad and changed his existing Invicta for another, the ex Eccles car, S 44, known in the club as “Stoat” – (Invicta Club members were encouraged to personalise their cars with a name beginning with the letter ‘S’). The car is described as having a black fabric body with green wheels and upholstery. The car is described as having been extensively overhauled and there was also an indication that Malone and his friend D. Monro in “Swordfish” would compete at Shelsey on 10th September. There is then a gap is the cars history between 1938 and 1947. It is most likely that the car would have been laid up during the war and probably only re-commissioned in 1947. Subsequently the car had a number of owners, some colourful characters and all documented in the history file. Notably the car appears in the famous ‘Shuttler’s Garage’ photo taken in 1958 where it is centre stage and surrounded by six other Invictas. By 1960 S 44 had passed into the hands of Julian Chiari of Southampton. He kept the car for five years before eventually advertising it for sale in October 1965 when the current owner made contact. The lengthy negotiations involved a visit to the pub and upon a satisfactory conclusion the only paper that could be found to draw up the agreement was tracing paper. Happily this document still exists today and sits in the history file signed and certified with a four penny stamp. Even more remarkable is that the new owner then began an epic tenure of the car that this year will mark 53 years. During his care he has amassed a wealth of paperwork to do with the car and these fill three binders. There are letters, photos, bills, MOT’s, log books, tax discs and a mass of other documents. The S Type Invicta is a rare and sought after car and S 44 has a remarkable history and is offered in a wonderful patinated condition.